There's an instructive review of The Box on Amazon – instructive in that in demonstrates how baffling Rabe's work can appear on first inspection. Our perplexed critic notes that "The narrative contains a great deal of detailed description yet at the same time much is left to the reader's imagination", before declaring that "the overall narrative flow is neither smooth nor logic driven. One gets the impression that this story is an allegorical one... I'm sorry to say that any such deeper meaning was woefully lost on me." Rabe is showing us those familiar thought processes we all run through in the aftermath of an argument or stand-off, fantasizing scenarios of how we should have handled it or how we might handle it in a similar situation (but probably never will). 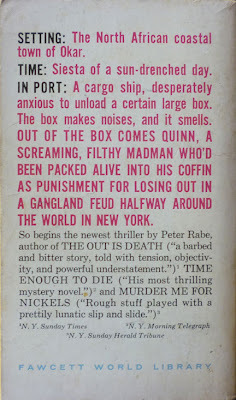 He uses plain language, but in unexpected ways, deploying colours for feelings, switching the narration to first person, finishing with that image of the false teeth popping out of the mob boss's mouth and then being crunched by Quinn. 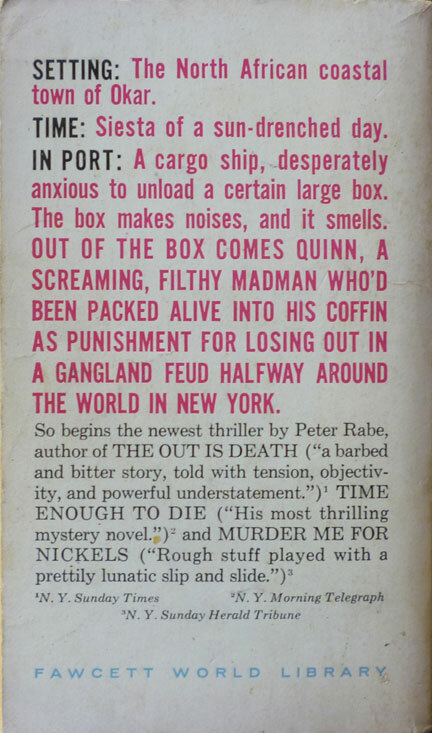 It's certainly not the kind of writing you expect to find in a pulpy paperback. 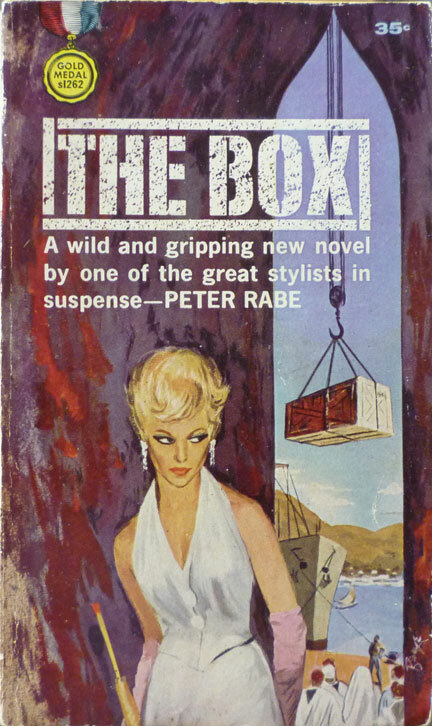 The cover painting for The Box is by Barye Phillips – or possibly Philips, with one 'l'; I've seen it spelled both ways online. 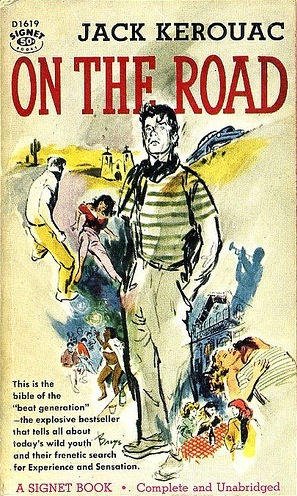 Barye was a Gold Medal stalwart who began painting paperback covers around 1943, prior to which he worked for Columbia Pictures' advertising department; later in his life he was President of the Society of Illustrators from 1965-67 (the Society's website has the single 'l' spelling of his surname). There's a great cover gallery of his work on this blog, including a 1958 Signet paperback of Jack Kerouac's On the Road. He was possessed of a loose, sometimes expressive, painterly style, one that reminds me a little of Harry Bennett in the way it occasionally mixes line art with splashes of colour. I like the logo for The Box too, which, appropriately, has been boxed. And it's interesting that, even back in 1962, it was recognised that Rabe was something special – witness that tagline about him being "one of the great stylists in suspense". Indeed he was.